Back by popular demand – our Athlete of the Month highlights individuals who continue to improve their health and fitness at our Plano or Prosper locations. This months athlete is – well – a REAL athlete! 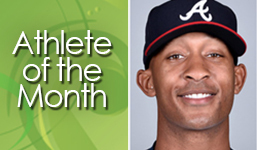 Sam Freeman of the Atlanta Braves. 1. At which studio(s) do you regularly workout? The studio in Prosper, Tx. 2. What is your favorite d’Pilates yoga workout (class, exercise or both)? All of the exercises on the reformer. 3. When not working out at dpilates, how do you spend your time? At home spending time with my family, reading, lifting weights or throwing. 4. What song(s) get you motivated to get through a workout? “Good morning” by Kanye West, “Boobie Miles” by Big K.R.I.T, “The Plan” by J. Cole, “Reminder” by The Weeknd, “Jukebox Hero” by Foreigner. 5. List 5 interesting Things we don’t know about you. I’ve been playing baseball since I was three. I’m currently a relief pitcher for the Atlanta Braves. I hated pitching when I was growing up. I idolized Torii Hunter growing up. I made my Mlb debut in the same game Johan Santana threw his first no hitter. 6. What 3 things are your must-haves? 7. In your own words, tell us about your experience so far at d’Pilates Yoga and Physical Therapy. I have really enjoyed my time working with Deanna at Dpilates. She is really thorough and hands on when it comes to explaining the exercises and their purpose. It is really exciting to see and feel the gains that have been made since I have started taking these classes.